[UPDATE Dec 17: Election Results] The incumbent Randy Horton [PLP] has defeated challenger Rodney Smith [OBA]. The incumbent Randy Horton [PLP] will be challenged by the OBA’s Rodney Smith. 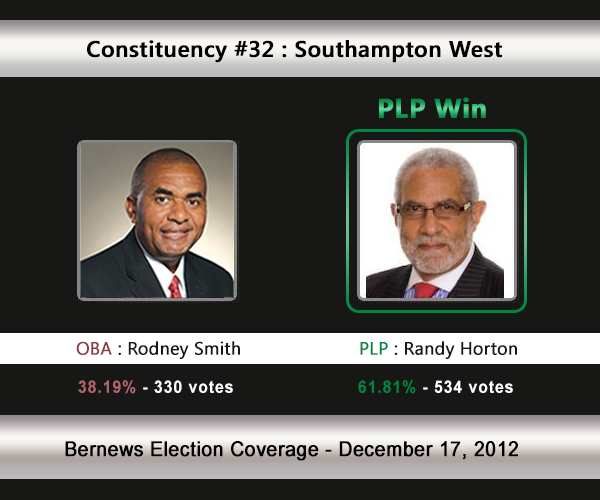 In the 2007 General Election, Mr Horton won 69.03% of the vote vs the UBP’s Charles Swan [629–366]. In the 2003 General Election, Mr Horton won with 63.08% of the vote against Al Wharton [UBP] who received 36.92%. 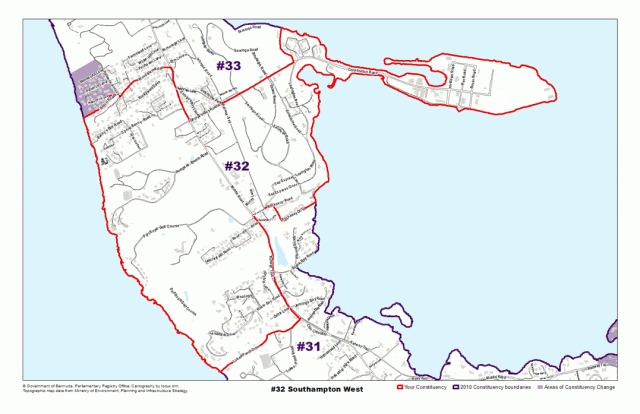 Areas the Southampton West constituency compromises of, or is located by, includes Middle Road, George’s Bay Road, Constitution Road, Rockaway Drive, Tribe Road No. 5, Luke’s Pond Road, Patience Avenue, and Woodlawn Road. Kenneth Howard Randolph Horton was first elected to Parliament in 1998 in the Hamilton West constituency. His multi-faceted range of experience includes achievements in sports, education, tourism promotion, and political service in the Progressive Labour Party. Mr. Horton was appointed Minister without Portfolio in February, 2001 and Minister of Community Affairs and Sport in November of that year. In July 2003, he wasappointed Minister of Labour, Home Affairs and Public Safety and in November 2006, he was appointed Minister of Education, Sports and Recreation. In July 2010 he became Chairman of the Parliamentary Joint Select Committee on the Causes of Violent Crime and Gun Violence in Bermuda and was elected Deputy Speaker of the House in May 2011. His educational qualifications include: a Teacher’s Certificate in Mathematics and Physical Education from Culham College in Oxfordshire; a Bachelor’s Degree in Economics from Rutgers University; a Master’s Degree in Educational Administration and Supervision from Rutgers; a World Trade Institute Certificate in Marketing and Tourism Promotions; and a Certificate in Executive Leadership from Cornell University in December 2010. He has also undertaken doctoral studies at George Washington University in Leadership and Policy Management. Mr. Horton has taught at both the elementary and high school levels in Bermuda, and at College level in the USA. He was Principal of Warwick Secondary School for 10 years. While there he was the driving force behind the first Community Education and Development Programme in Bermuda. Mr. Horton has played professional football with the New York Cosmos; the Washington Diplomats and the Hartford Bicentennials. He was also Assistant Coach at Jersey City State College and as the Women’s Varsity Coach at George Washington University. In Bermuda, Mr. Horton played and coached the Somerset Trojans and represented Bermuda in both football and cricket. In June, 2002, Mr. Horton was honoured by the Institute for International Sport as part of their annual International Scholar-Athlete Hall of Fame induction ceremony in Rhode Island, USA. In 2004, he was one of the first ten inductees to the Bermuda Sports Hall of Fame for his achievements in cricket and football. Mr. Horton joined the Bermuda Department of Tourism in 1986 as Assistant Director with responsibilities for developing local promotions and special events. In February 1999, he was appointed Director of Training and a member of the Executive Team at the Fairmont Hamilton Princess Hotel. He has served on numerous committees and boards including the Hotel Pensions Fund; the Executive of the Amalgamated Bermuda Union of Teachers; the Police Advisory Council; and the Sports Development Council and as Chairman of the Board of Bermuda College. He was appointed Chairman of the Air Advisory Board at the LF Wade International Airport in January 2011 and is also a member of the Tourism Board. Mr. Horton and his wife have two daughters. Rodney Smith, born in 1960, spent his childhood at homes in Sinky Bay and in Riviera Estates in Southampton. In Bermuda, he went to school at Heron Bay, then Sandys Secondary. He went on to Oakwood University in Alabama, where he was awarded first a Bachelor’s degree in Pastoral Studies, then a Master’s. He completed the coursework for a Master’s degree in Social Work at Howard University in Washington and completed two semesters of law school at Buckingham University in England. To help fund his education, he worked on a variety of construction sites as a mason and a labourer. Education finished, he founded R.A.S. Construction, and built and sold houses for 20 years. His employees were largely ex-convicts and, as a man dedicated to motivating and encouraging young people to set goals and work to achieve them, he recalls with some pride that many of them went on to own their own businesses. He developed a method of teaching people on a fixed income how to buy their own homes with little or no money down. The venture was a resounding success, and as a result of it, 500 people become new homeowners. He also spent time teaching people how to achieve their personal goals through planning and managing their financial affairs, and claims to have had success with thousands of them. He was a consultant to the Government of Bermuda, which asked that he research and write a paper highlighting the difficulties hindering fathers anxious to have visitation rights to their children. The recommendations contained in his paper, Mama’s Property – Daddy’s Child, were the basis of recent changes in the law. He has been a motivational speaker at a number of public forums and at schools, encouraging young men, especially young black men, to have a positive attitude about life and stay in school. His knowledge of gerontology, that is the process of aging, has meant that he has often been called upon to assist in improving the quality of life of Bermuda’s seniors. His life, since he retired from the construction business, has been dedicated to community work, trying to address Bermuda’s social concerns. Rodney Smith is married to Analyn, and the couple has two children, Esther Renee, who is five, and Alvin Patrick, who is nine months. He has three older children = Victoria, 27, Rodney, 23 and Senecia, who is 16. In 1998, Rodney was crowned The Real Fish Cake King of Bermuda – and although he has largely retired on those laurels, he still makes fish cakes at his home in Pembroke for close friends and on special occasions.